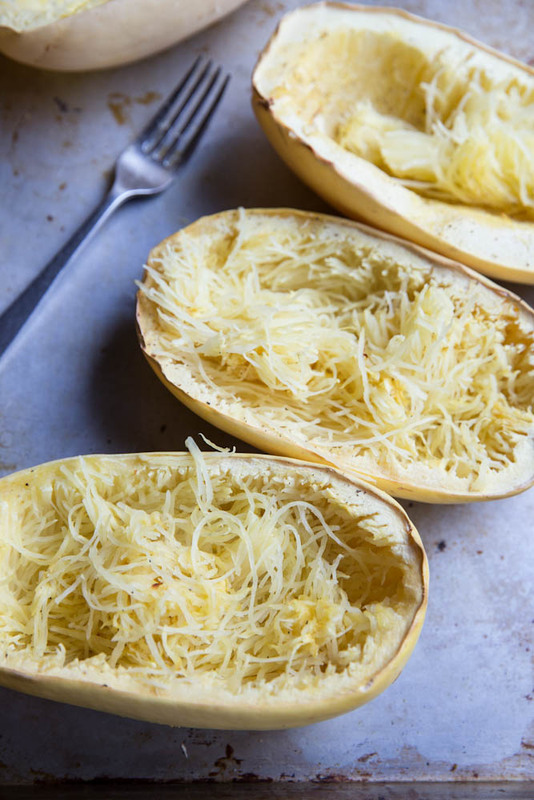 I typically go classic when I make spaghetti squash, using it to replace regular spaghetti. This recipe for Twice Baked Spaghetti Sauce keeps it all traditional but adds that toasted, cheesy component as you put it back in the oven for the second time. 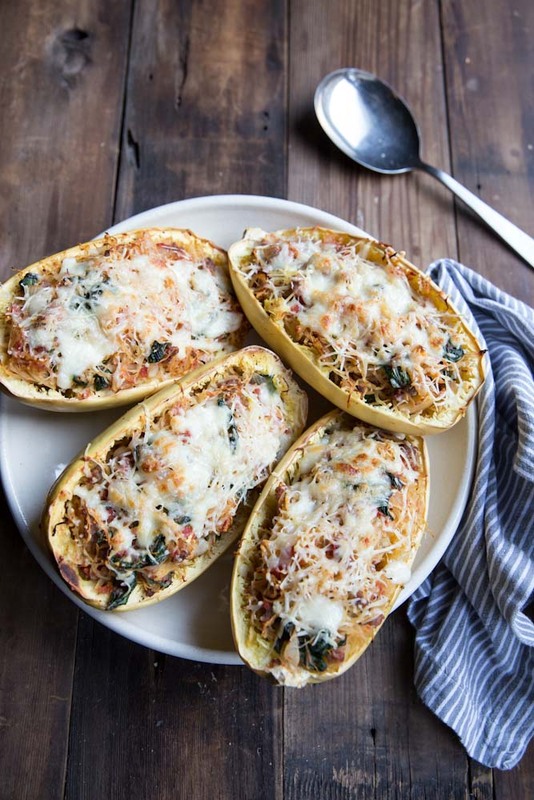 Ingredients for this dish are simple – spaghetti squash, marinara sauce (buy your favorite or make your own), spinach, sausage, and cheese. Of course you can alter to your preference and based on what you have in your kitchen. I’ve mentioned to you a few times that I’m wanting to go a bit deeper into the idea of hospitality. What it means to be hospitable, literally and spiritually. Many people say that I have a gift of hospitality but lately our dinner party calendar has been pretty blank and I have felt like a big slacker. Coming from the South I see hospitality as my grandma’s silver sitting atop folded linen napkins, and several bowls and dishes carrying foods of all sorts, all awaiting dinner guests at our table. For several years I have felt God working on my heart in this area. Can I be hospitable with just one dish on the table and a stack of paper plates (cringing at the thought even now). I really have simplified things and thought I was beginning to understand hospitality in a deeper sense then, I did this short study on hospitality over at SheReadsTruth.com which really threw me for a loop. I thought hospitality was “welcoming and caring for people in your home or space”. Which I still think it is, but I loved learning that hospitality “provides a space where strangers can cast off their strangeness.” I never thought about how hospitality helps me to cast off the strangeness of others so I can see and connect with the people they really are. Hanging with strangers is uncomfortable for me, but practicing hospitality that casts off this strangeness encourages me to do it. I also feel grateful for the hosts that give this gift to me. I thought hospitality was – making people comfortable in my home. Jesus shows that hospitality is – being authentic and vulnerable with people, which isn’t always comfortable. I used to think hospitality was – a skill. Something that was learned by your culture or upbringing, that you could meet society’s or people’s expectations better or worse based on how good you were at this hospitality thing. Jesus shows that hospitality is – an attitude, a willingness for vulnerability and connection. That it’s not a one way street about what abilities I have, but a giving of ourselves and receiving from others. We thought hospitality was preparing and providing for specific people at specific times. Jesus shows that hospitality is allowing your life to be interrupted for anyone’s needs. I thought hospitality was having fresh cookies on the table, a clean house and waiting on a guest. Jesus taught me that hospitality is a deep sensitivity to the real needs of people. It is an ability to meet real and felt needs through compassion, sincerity, peace and generosity. For me, I used to think of hospitality as entertaining or hosting my friends for an impressive meal but now I want to view it as an invitation – and it doesn’t even have to be for dinner. It’s an invitation to be heard, welcomed, loved, and received by Christ. In some ways this type of hospitality is easier. 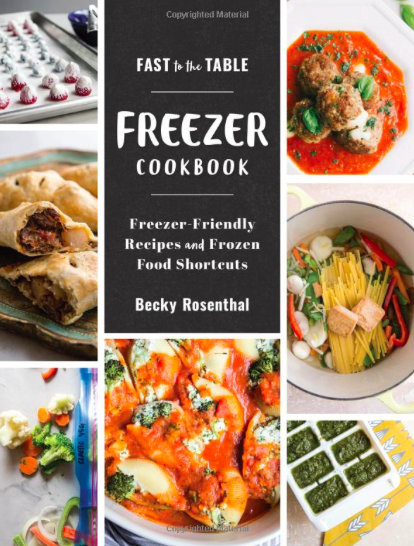 Less prep and fuss over whats being served or on the place where you’re hosting someone. But then it’s also harder… giving of yourself, your time and your heart to listen and care for those around you. This type of sincerity is rare and excessive in the best sense. 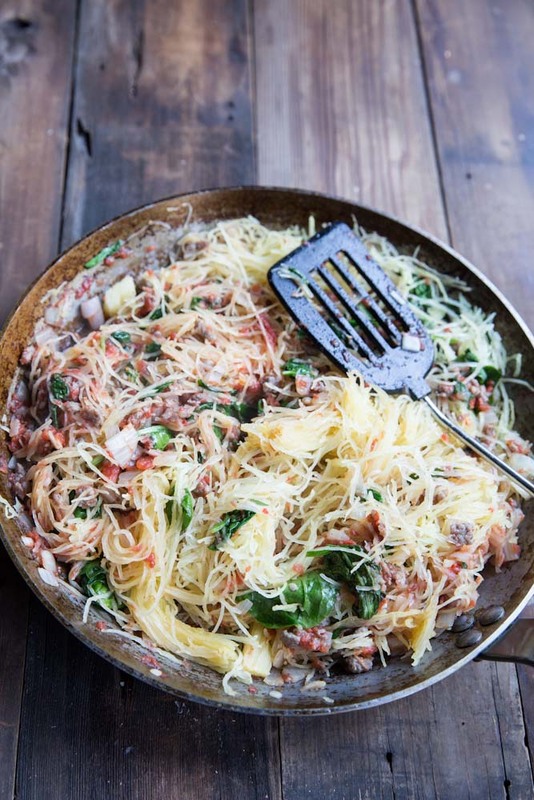 This is the perfect simple homemade dish to make and have a few guests over. You can even make it a day ahead and just wait to bake it for the second time right before your guests arrive. Add a baguette and a quick tossed salad if you’d like or just serve the squash by themselves. Either way you can and should be confident and proud to be yourself and others well. Simple dishes like this allow me, and you too, to focus on the person on the other side of our table whether it be your spouse and kids, or someone new or in need. Less prep more peace and patience. Less attention to detail and more attentiveness to those sharing a meal with you. Simplicity reigns yet again. 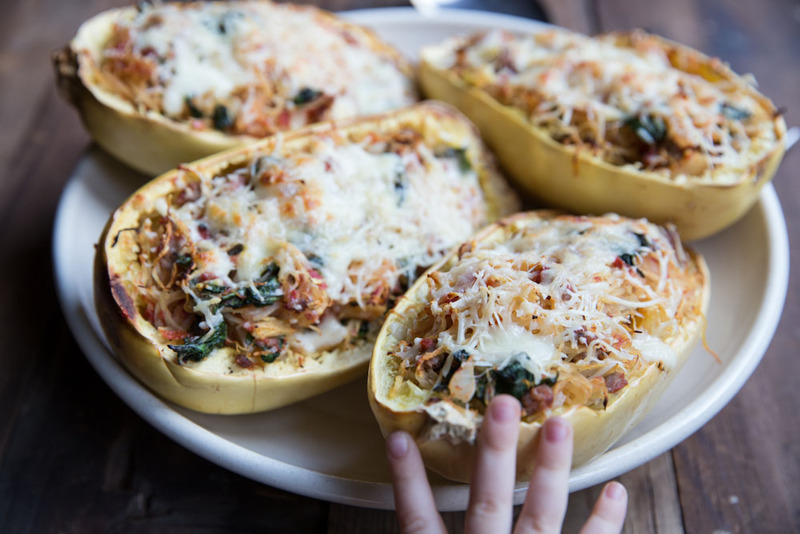 An easy recipe for twice baked spaghetti squash using classic ingredients you already have in your kitchen. 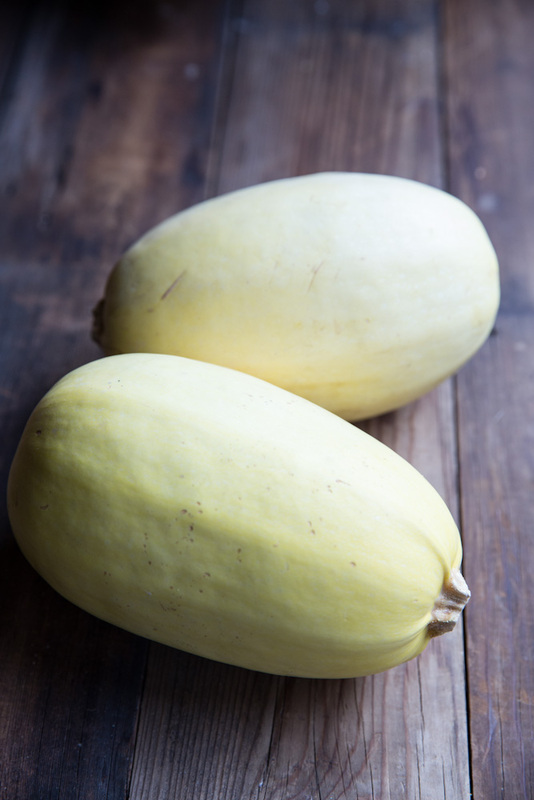 Slice the two spaghetti squash in half lengthwise (stem to tail) and scoop out seeds and stringy flesh. 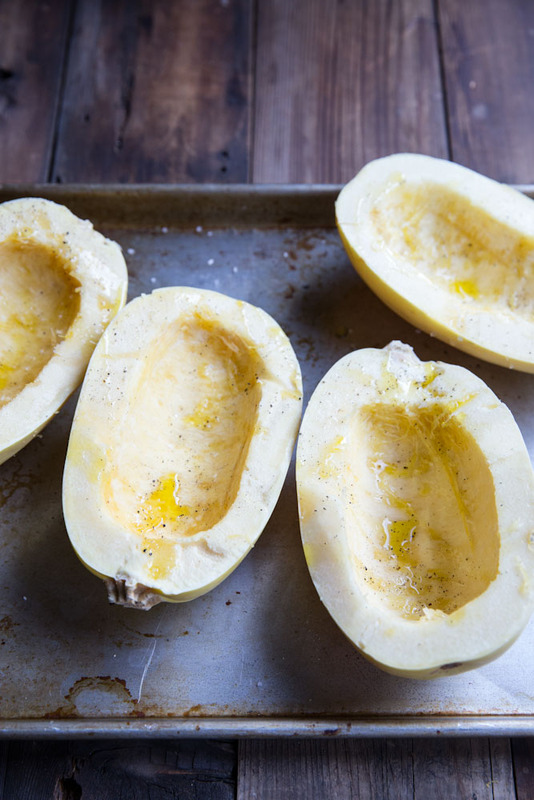 Place squash on a rimmed baking sheet and drizzle with 1 of the tablespoons of oil. Sprinkle with salt and pepper then bake for 40 minutes (smaller squash may need only 30-35 minutes). Meanwhile, in a large skillet over medium heat sauté the chopped onion in the other half of the olive oil (1 tablespoon). Cook the onion until translucent (about 5 minutes). Then, add in the sausage and continue to cook until sausage is all browned. Add in marinara sauce. 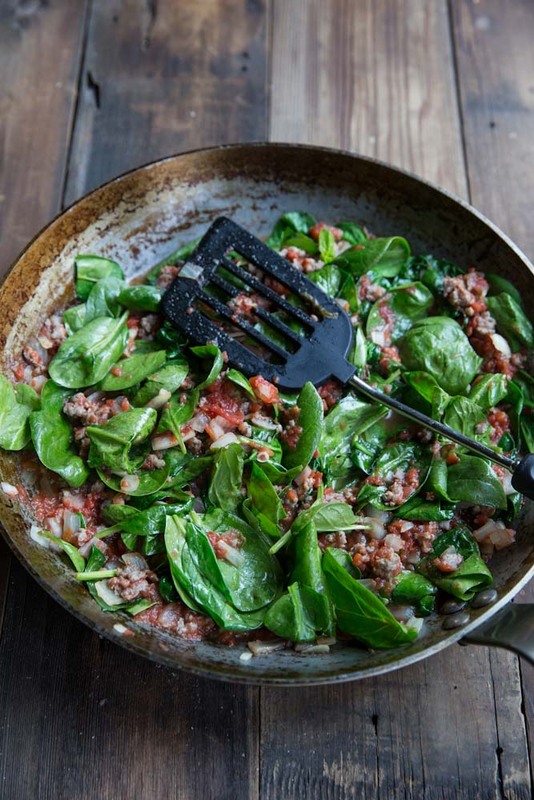 Once the sauce is hot and bubbling stern in the spinach a handful at a time, until it is all wilted (this should only take a minute or two). If squash is still cooking at this point, remove the skillet from the heat and let sit until squash is ready. Once squash is out of the oven, use a fork to gently pull the squash flesh from the peel, separating the flesh into strands. If the squash seems too hard to scrape, return it to the oven for an additional 10 minutes. Rake your fork in the same direction as the strands to make the longest "noodles." Toss the squash noodles into the sauce mixture then place back into the peels. Topp each squash half with cheese, dividing the mozzarella and parmesan between the 4 halves. Place back in the oven for 15 minutes or until cheese is bubbly. I love this! Such great thoughts on hospitality Becky!! I have been really digging into this thought process in my own life too. It’s not easy to open ourselves up in true hospitality, but it sure is beautiful when we do! Annalise, I know!! It’s much harder, right? But so much more rewarding that just serving a big fancy meal. Speaking as that super awkward person to whom hospitality doesn’t come naturally, it is a natural talent for some, and in others it is a discipline that is learned through study and practice. 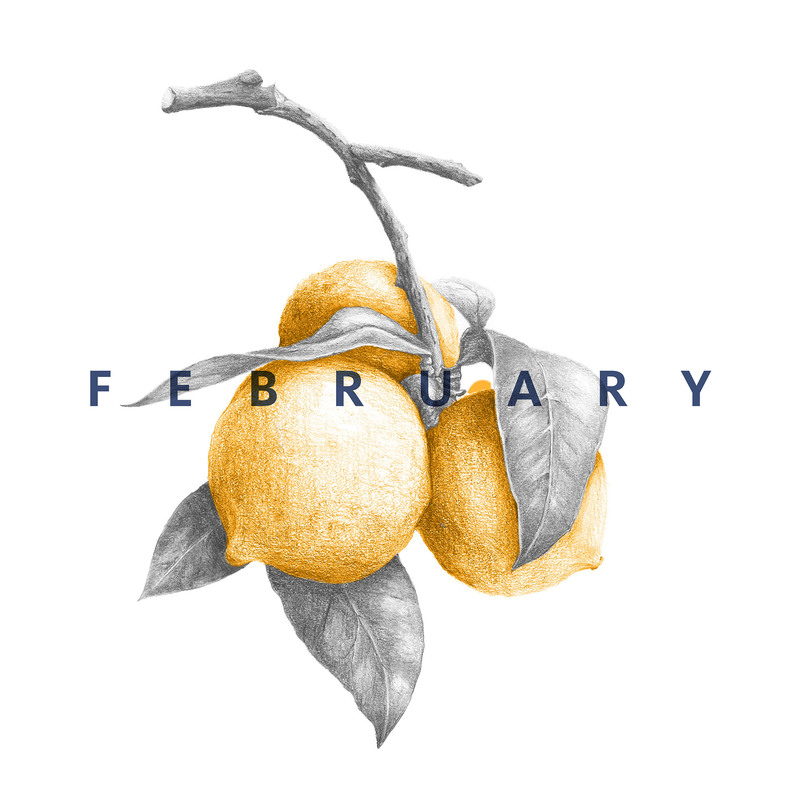 But you’re right about it’s about being the hostess with the perfect dinner service (which is nice) and more about the attitude: love, thoughtfulness, patience, and charity. Beautiful post, I can’t wait to try the recipe. Thanks so much for sharing this meal with us! I’ve been wanting to recreate ever since. We need to get together for another dinner prep session soon. What a genuine and thoughtful post. Thank you for enlightening me to another dimension of hospitality. As to the recipe, we made it for dinner last night and LOVED it. The simplicity and flavors were perfect; I have a feeling it will be on a regular rotation in our home. Miranda! Great to hear from you! I’m so glad you enjoyed the twice baked squash. It’s a regular for us now too! Hope you’re having a great day in St Louis! I loved your thoughts on this! I’m going to have to do some deep thinking to see where I stand in this mix, because you are right about all of it I think I’m just slow to really feel what hospitality is. Thank you! And that squash looks fabulous. Thanks Melissa 🙂 I’m still trying to sort it all out myself. I think giving yourself some grace in the process is a good place to start. Don’t expect perfection and this will make your guests feel more comfortable anyway! Thanks for the recipe! I tried it this past weekend and it turned out well. R, thanks so much for sharing! Glad you enjoyed the recipe! Thanks so much Kalyn! That’s such an honor!! Made this tonight for dinner, and it was delicious! Thanks for sharing this recipe. Yeah!! Thanks so much for sharing! I was just thinking about this recipe yesterday and how we need to make it again soon! Amazing recipe!! So easy but it looks like I slaved for hours over it. I have made it twice so far. Thanks! So great to here it Danica!